I Did My First Facebook LIVE and I Liked It!!! Hi Sewing Friends! Happy 2018! I'm so excited for 2018! I really think this is going to be a big year for me. Thanks for following me on this journey! So, I did my first Facebook LIVE video today, and I liked it! I'll post it as soon as I can teach myself how to download it from Facebook and upload it here. Rut-roh!!! The sound was horrible so I deleted the video. However, I figured out how to upload it here the next time! I mentioned a couple dates and want to jot them down here for you! Are you interested in taking a class from me in the Hagerstown, Maryland area? I'd love to teach you how to make the Cell Phone Wallet from Hold Everything Purses, Totes and More! written by Pam Damour and Betty Mitchell. I am now a Certified National Educator for Pam Damour! It's hard to believe it's time to start thinking about Christmas already. We all know it takes time and TLC to make special handmade gifts from the heart for our family and friends. In this video, I inspire you to embellish a preprinted panel with Sulky decorative threads. I also give you amazing tips and exercises to practice so that you can free motion sew, or quilt interconnecting circles! If I can do it, so can you! It's really a lot of fun and easy, especially after you practice. ​Let me hear a whoa hoo! I hope this video inspires you to try embellishing a preprinted panel with beautiful Sulky threads. 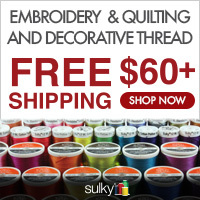 By the way, don't forget to visit my shop to link to the Sulky online store, if you need to order supplies! Here's the exercise sheet I promised. Print it out on regular paper and practice tracing the lines and complete the rest of the row. The next exercise is optional, and well worth it. When you are ready, print the exercise sheet on a piece of Sulky Sticky Fabri-Solvy Stabilizer (soon to be called Stick 'n Stitch) from your home printer. This is a Wash Away stabilizer, and is available in convenient 8 ½" by 11" sheets. It has a self-adhesive backing, like a postage stamp. Peel that backing off and place it on a practice quilt sandwich! There's one or two more exercises you can try, and I explain them in the video. I hope you enjoyed this post and are inspired to embellish preprinted panels with beautiful Sulky decorative threads.